« Bus & Train Seats. 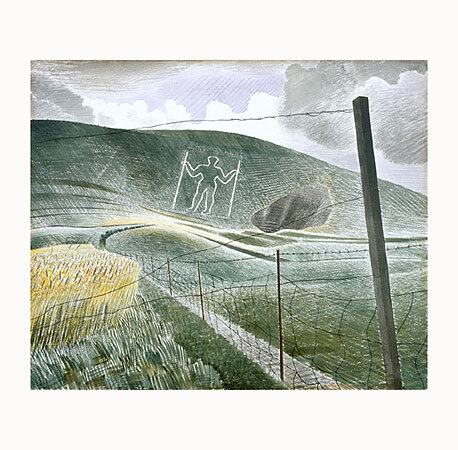 In the last post, I mentioned the man with the marvelous name of Ravilious: Eric Ravilious. 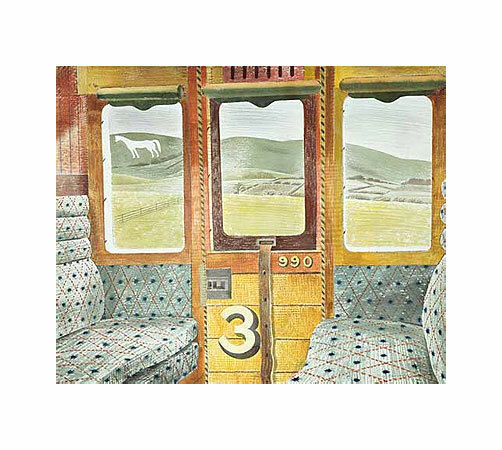 Here’s a picture of his that shows a typical pre-war train-seat pattern–apparently the late nineteen-thirties’ London art world was obsessed with train seats–he didn’t depict the light accurately (it’s much too light inside the carriage); but if he’d done it correctly, he wouldn’t have been able to show the seat fabric pattern so clearly, and that would be a shame since it covers about one-third of the picture surface. I like the faint reflection in the glass of the seats. Note the draught-stopping piece of moquette on either side of the door, piping with a barber’s-pole pattern. I remember it, also the leather strap that suspended the window when it was opened. Later, he did a lot of dark 2-colour prints for London Transport, but I suppose this picture was used to advertise the railway to the west country. If the 3 stands for third class, then it looks good value for money. I would like to have painted it myself. With its very high horizon you look down across the contours of the ground; they are very precisely shown by tone, oblique grass patterns, the road, the paths and the fence. The fence, the windswept bushes and the diminishing size of the trees show the scale of the receding landscape; without them, in other words, you couldn’t judge the size of the hills. But the first one is my favourite. I have a book of them. 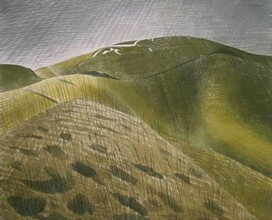 All the Eric Ravilious’s work I’ve shown is Copyright of the Estate of Eric Ravilious. I love the way that that ewe has trained the two codgers to drag her about. Yes – it’s called the ewe-bahn. On its way to Baden-Baden, no doubt. It’s the only time I’ve heard the name, Language. Could they be the only Reviliouses in Britain if they’d been there for 400-odd years? Yes, I agree, Julia. There are a lot of those figures (men & horses, mostly) carved into the chalk hillsides of southern England. Some are supposed to be pretty old, the Uffington White Horse is from the Bronze Age (probably between 1200 BC and 800 BC); the current Westbury one was cut in 1788, apparently. Could they be the only Reviliouses in Britain if they’d been there for 400-odd years? They could indeed. Many family names have died out over the centuries; it’s a lucky name that’s made it this far. Is there a list somewhere of names that have died out? If there is, I know you will have it. I would add to the list of possible variant names, Révillon, the name of a famous French fur company. Could Revilious (which does not look right) be a mistaken form of Révillons? Some of the other forms also look like they might have been written down as approximations by an English clerk rather than by the immigrants themselves (as at Ellis Island centuries later). 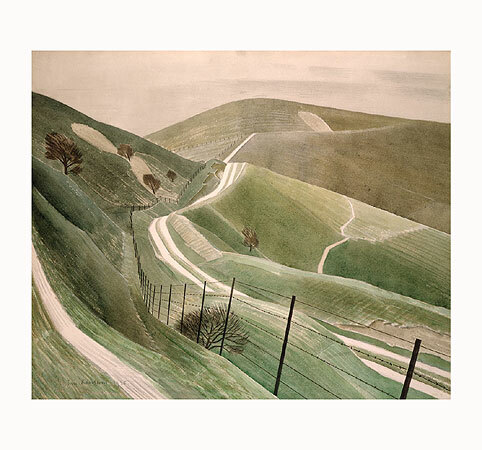 The Chalk Paths drawing is great, not just because of the different shades of green intersected by the stark white road (I take it there is a real landscape that color) but also since at first glance the landscape appears to be reduced to planes, when real hills are curved. Maybe this is some influence of cubism? Ah, how I wish I could justify your touching faith! Alas, I have no such list, and I too would like to see one. I do have a discussion of the phenomenon somewhere, and if I weren’t behind in my editing I’d probably waste the better part of a day hunting around through my books for it. But I am, so I won’t. If I run across it by accident, though, I’ll post it here. I love that Uffington horse. There are some similar native American figures on hillsides here, called “effigy mounds”, generally at a river confluence, but not so elaborate. If you want to see them you pretty much have to hike through the woods. Thank you AJP, Now I will search about those British figures. 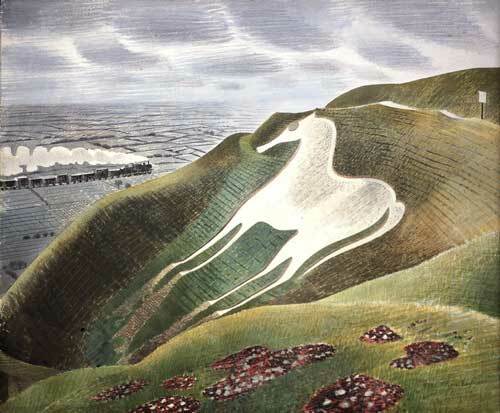 correction: the name I meant is Revillon not Révillon, and it fits better with the initial syllable of “Ravilious” (pronounced the English way). At the time of Huguenot emigration, the -ill- part (now pronounced “-y-“) was closer to -ily-, written -ili- as in the English adaptation. The final “s” is probably a plural, added when a whole family of “Revillons” arrived together. Good work, m-l! 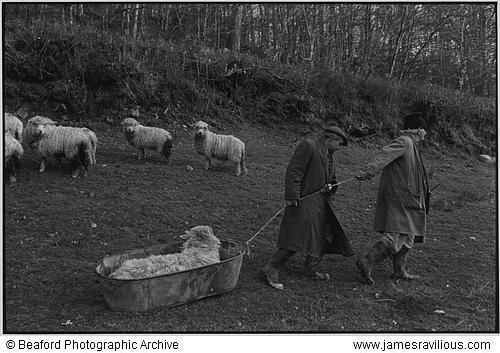 I think you ought to tell James Ravilious’s wife & children about your deduction. I’m sure they would love to know even if you’re not certain. I don’t know, it could also be a Latinate ending of the type that was so common in the Early Modern period (Linnaeus for example). A latinate ending would be more likely to have -ius rather than -ious. But latinate endings used to be popular among scholars and scientists, who wrote in Latin for others of the same ilk (therefore latinate form of the names were needed in order to use them in writing proper Latin), not among ordinary people: “Linnaeus, Gropius, Erasmus, Cartesius”, etc. “Linnaeus” called himself “von Linné” in high society, after he became famous as a scientist. Current names ending in -us (like “Petraeus”) all seem to come from the Baltic states, where the use of Latin for official documents lasted much longer then elsewhere in Europe. Balthus, the painter, is a recent name. I think he may have made it up himself. I can’t think of any Britishers who are known by a Latinised version of another name. Porteous is another of those names, I suppose. I think of Porteous as being a northern Irish name; I’m not sure if that’s right, though. Maybe if you go back far enough. Like Pelagius, if we believe that he was Morgan or Moriarty or something like that. Yes, there are lots of Roman names, like Boedicea’s husband, Prasutagus; and Latin names for English kings were also common later–on coins, for instance, but I can’t think of a British equivalent example of the “Linnaeus”-type usage. For a minute, I thought Charles Carroll of Carrollton might be a US example, but I guess not. I agree. It’s hard to come up with such an unambiguous example. Like L’Ecluse is usually Clusius. John Ray wrote under the name Raius. I imagine if you said / wrote Raius, people would be clear who you meant. But I don’t think that’s really how he’s known today. Yeah, on further consideration I withdraw the Latin suggestion. At any rate, certainly an odd name. Just discovered that Melanchthon‘s real name was Schwartzerd (both meaning ‘black earth’). Love those show-off Latinists!